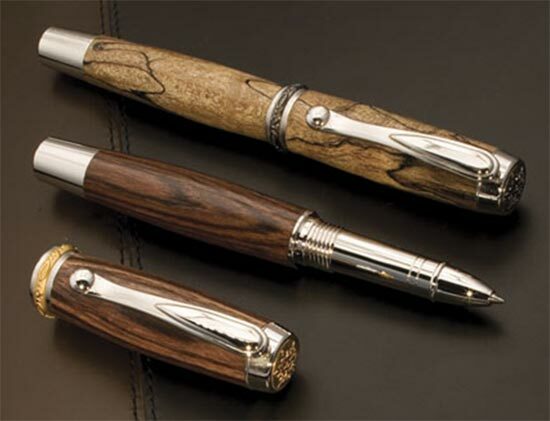 Still the most elegant junior size pen kit available today, the Jnr. Statesman II has undergone several improvements, including a new thread design for effortless operation and dependability, along with a redesigned end cap for improved alignment. Manufactured from the highest quality components available, the Jnr. Statesman II is available in rich 22k gold or Black Titanium hand-cast engraved inset on the cap surrounded by a sea of brilliant Rhodium. The stunning blend of colored insets and accent band, combined with brilliant Rhodium plated components, make the Jnr. Statesman II a distinctive pen of unrivalled beauty. Pen measures 1/2" x 4 3/4" long. The fountain pen features a top quality German-made two-tone nib with genuine iridium point, for smooth writing and dependable ink flow, while the rollerball is supplied with a ceramic tipped Schmidt ® cartridge for smooth, effortless writing. Fountain model will accept standard ink cartridges as well as ink reservoirs.